We are engaged in supplying quality conventional fire detection & notifications that meets the demands of our clients spread across the globe. These are available in various shapes, sizes and models as per client’s specifications. Known for their excellent quality, dimensional accuracy and high efficiency, these are highly demanded worldwide. Our range comprises fire detection system, addressable fire alarm systems, analog fire alarm system, commercial fire sprinklers, automatic fire suppression systems. We offer a range of high quality conventional fire detection system that are made to meet the demands of our clients spread across the globe. These conventional fire detection system are designed to give warning of the outbreak of fire and allow necessary fire fighting action to be taken before the situation gets out of control. Our range of fire detection system are available in various shapes, sizes and models to suit the varied requirements of the clients. Compliant to international standards, our range of fire detection system and fire detectors is known for its excellent quality, dimensional accuracy and high efficiency. 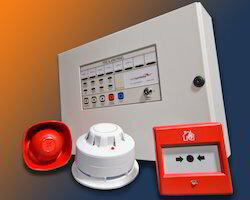 Looking for Conventional Fire Detection & Notifications ?